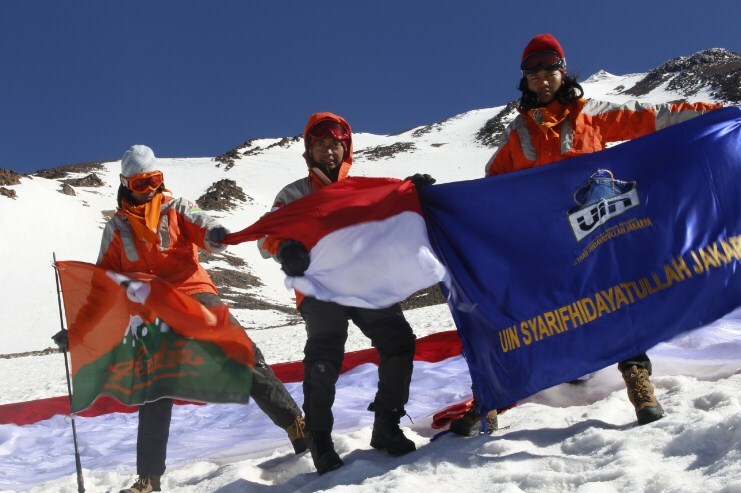 Ciputat, UIN NEWS Onlineâ€“ UIN Jakarta Nature Lover Group (KPA) Arkadia successfully conquered the highest volcanoes in Iran and Asia, Mt DamÄvand or Donbavand, on a climbing expedition from 7-28 May 2017. 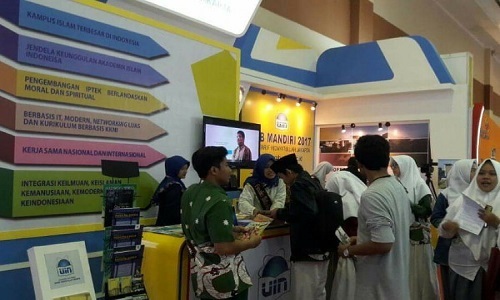 Besides climbing, the activity undertaken to celebrate 60 years ADIA / IAIN / UIN Jakarta is filled with seminars and exhibitions of Indonesian cultural introductions and UIN Jakarta to the local community. The team consists of Mohammed Aminullah (FIDK / Semester 6), Ahmad Khoiri (FSH / 8), M. Abdul Bait (FU / 6), Hasan Hadi Sofian (FU / 10), and spokesman Iwan Buana. To the UIN Online News, Wednesday (6/14/2017), Aminullah who is also head of the group said, before doing the climb, first the preparation of participants mental and physics should be done. According to Aminulloh, the readiness of participantâ€™s physical and mental is very critical considering the height of the mountain to be climbed reaches 5,610 meters or 18,406 foot, placing it as one of the highest mountains in the world. Also, the climate of rocky ice added the challenges that require physical and mental readiness. “Surely it takes hard work and effort from the Arkadia Expedition Team. Hence, before we climb we did exercise for one year and sacrificed many things, from college to family. But it all paid off already when we reached the summit and waving the National flag,”said Aminullah. Based on the search conducted by UIN NEWS Online noted, Mount DamÄvand which is also called Donbavand is the sleeping volcano and the highest peak in Iran. This mountain is also the highest point in the Middle East and the highest volcano in Asia. The mountain itself is located in the middle of the Alborz Mountains. Besides climbing Damavand, Aminullah added, the Arkadia group performed a series of other events. In the first week in Iran, for example, the Arkadian delegation participated in a short course on Iranian thought, history, and culture. After the second week of ascent in Iran, the Arcadian group held an exhibition of Indonesian culture and UIN Jakarta in Tehran University. In the last week, the team conducted a cultural exploration to the city of Isfahan by visiting sites and places of worship of the religion of Majusi or Zoroaster. Hasan added that the exhibition at Tehran University was conducted by exhibiting various exotic Indonesian products such as woven cloth, batik, angklung musical instrument, Indonesian carving products, books and photography works of natural beauty and Indonesian culture. “We want the Iranian people to know about the beauty of our culture,” he added. Earlier in her general lecture on Opportunities and Challenges of the Future of Sharia Economics at the Main Auditorium on Thursday (5/25/2017), Finance Minister Sri Mulyani Indrawati praised the students of the Arcadian group who attempted to conquer Damavand. 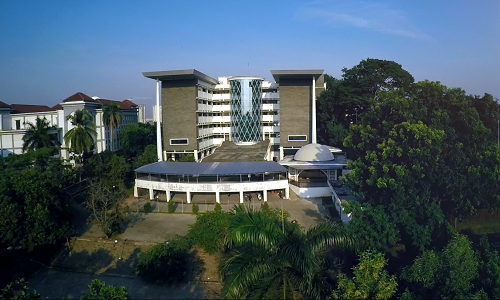 According to her, their efforts to conquer one of the highest mountains in the Middle East need to be a reflection of the civitas academica of UIN Jakarta in advancing the institution. “The efforts of some friends who conquered one of the highest mountains deserved to be appreciated by making it as a reflection on the need of the civitas academica in strengthening the determination to advance UIN Jakarta in its 60th year,” he said.. In addition to the Minister of Finance, Rector Prof. Dr. Dede Rosyada MA also claimed to be proud of the achievements of Arkadian students who managed to conquer the mountain. Moreover, the Arkadia group is the only group of students climbers from Islamic Higher Education of Indonesia who managed to conquer the mountain.